From the “Revisiting the Early 70's” Series” by Paul J. Stankard. 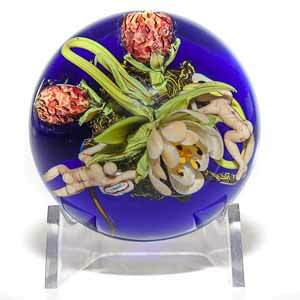 This miniature paperweight features a Peach Flower, 2 Fruit Clusters, 2 Root People and Green Leaves on a Cobalt Blue Ground. 2018, 2.5″ d x 1.5″ H approx.